Home/Divorce/Who Gets the Family Pet When Couples Divorce in Tennessee? For many couples, their dog, cat, bird, fish, or other pet takes on human qualities. Taking possession of the family pet can be just as important as keeping other valuable assets. For children, who are upset about their parents splitting up, keeping their furry friends can help make the post-divorce adjustments a lot easier, too. Alas, Tennessee, does not treat pets as humans. Hard as that may be to believe, there are no Tennessee laws that permit custody fights over the family pet. There are no legal arguments that can be made to show the pet would be better with one spouse than the other. There’s no scenario where your dog can legally be given the choice to walk towards the spouse it would prefer to live with. Family pets are divided in the same way that homes, cars, cash, and other family are divided. The assets are identified, categorized, valued, and equitably divided, just like any other type of property. But a dog or cat can’t be divided into half. One spouse must be awarded possession of the family’s best friend. Marital property is the property the spouses acquire during the marriage. It does not include property bought or acquired before the marriage or after the parties separate. So, for starters, if one spouse owned the family dog before the marriage, then that spouse should be able to keep the animal. Equitable distribution means identifying all marital property and then dividing the property in a fair manner. Tennessee analyzes many factors to determine what makes for a fair division. The division does need to be 50-50. Often, a spouse who has less ability to earn an income or a spouse who will be taking care of the children will get more than 50%. Property division factors also include the health and age of the spouses. Who can walk the dog? Who can feed the dog? Who can take the dog to the vet if needed? Is the residence a good or permissible environment for the pet? Who has primary custody of the children? 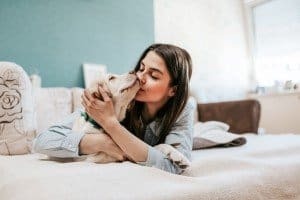 While custody factors and custody law don’t control pet division, spouses can agree to share the dog. One parent may get to keep the dog if the other goes on vacation. Spouses can agree that the other parent can regularly spend time with the dog. If spouses can’t agree as to which spouse keeps the dog, the family court will make a decision. In most cases, though, the family judge will request that the former couple make a firm effort to decide pet ownership themselves. At LaFevor & Slaughter, our pet-loving lawyers understand how important it is to keep the family pet. When dog ownership is a priority, we work to negotiate property division settlements that help you keep your beloved animal. Our Knoxville divorce lawyers also understand what factors can help a judge decided your pet should stay with you. For help now, please phone us at 865.272.4454 or fill out our contact form to schedule a free consultation.